If you’ve read the two previous posts on this topic, you might think that I’ve thus settled contentedly into scraping plane heaven. Not quite, there is one more thing. The scraping plane is generally thought of as a finishing tool, analogous to a smoothing plane, suited for difficult, figured, dense woods that are prone to dreaded tearout. However, there are times when I use the scraping plane one step prior to finishing the surface. I will explain. Like most woodworkers, I dimension almost all my wood by machine. With figured woods, shallow tearout often remains despite using good technique and well-tuned machinery. One method to get rid of this shallow tearout would be to first use the jack plane cross grain, possibly initially with a toothed blade, then go to the scraping plane. Now I’ve got another option that is on a finer scale. I have prepared one of my Hock scraping plane blades with what I will call “microtoothing.” This toothed blade is not quite like those that are commercially available and often used to prepare a substrate for hammer veneering. I abrade, lengthwise, the unbeveled side of a 0.094″ thick Hock blade using a coarse file and very coarse abrasive paper, then make very shallow cuts with a fine saw file, about 20 or more per inch. I then file and medium hone the 45̊ bevel and burnish as usual at 15̊. 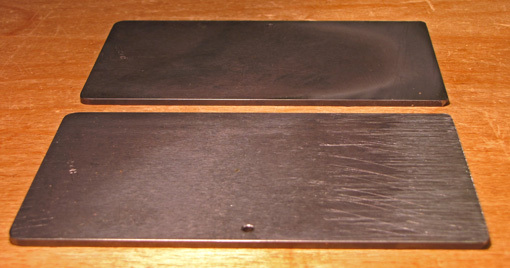 The photo below shows the microtoothed blade below a conventionally prepared blade. The result is not a dull scraper. It is sharp, but has “microteeth.” It does not produce dust, as would a dull scraper blade, but rather shavings that resemble ultra thin cheese shreddings. (See photo at top.) The fine or coarse serrations split the shavings at every depth of cut. The huge advantage is the extremely smooth cutting action. There’s never a hang-up, slice, or chatter. The plane can be worked back and forth on the wood with abandon. The very shallow ridges that remain on the wood are quickly dispensed with by a conventionally prepared blade in the scraping plane. This has been a very effective way to reliably remove shallow tearout with the scraping plane in the worst of woods. I use it when the jack plane procedure would be too much, but going to a clean, conventionally sharpened scraping plane blade would take too many fastidious passes. It has even allowed me to do away with thoughts of purchasing a drum sander. One issue I’m trying to resolve with making wooden fences on a shooting board is to make them less slippery, so the material doesn’t slide forward too easily. I won’t use an abrasive paper, and I’m considering the idea of a toothing plane to roughen the surfaces. Do you think the texture of the toothed scraping iron would work well? 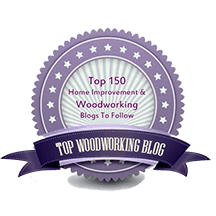 First off, thanks for your blog series – you’re approach of mixed power and hand tools while maintaining the hand-tool, 1-sided tolerance mindset makes the most sense to me. Your series on drawers is especially helpful to me as I set about designing and building my first drawers right now. Anyway, to the subject at hand: thanks for this wonderful tip. I dont have a scraper plane, but I’ll definitely try this on one edge of my card scraper on some nasty interlocked mahogany that gave me no end of planing trouble. Nah, doesn’t seem like a good idea to me. It would be hard to judge the squareness of the fence against the blade of the square. And it wouldn’t look nice. Maybe just leave it as is and let the user apply PSA sandpaper as desired. Thanks. Good luck with the drawers! I don’t think the microtoothing idea would carry over very well to a card scraper. There’s really no reason to use it for that tool. But I guess the worst that could happen is you mess up a $5 tool. I’ve never tried it for a card scraper. There is a Super-High-Friction (no-slip) Tape sold by Lee Valley that you might try. Didn’t you say you used the stuff on the bottom of your bench legs? I’m interested to know why you dont think there’s a reason to use it on the card scraper? Like you say, at worst I’ll mess up a $5 tool – really only 1 edge of 8 and one that I use least, anyway. Yes. Works well there to immobilize my bench on my varnished shop floor. The tape is stable just because there is a lot of weight over it, but in other situations the adhesive on the tape flows very easily and the tape therefore tends to shift. My reasoning is that the card scraper is purely a finishing tool – the last step. Further, there’s rarely a problem with chatter or hang-up or slicing with the card scraper. The situation I’m describing is using the scraping plane with the microtooth setup to take away shallow tearout while retaining the dimensional trueness that the machinery gave. Then finish off with a conventionally sharpened blade. But hey, it can’t hurt to experiment and maybe your idea will suit your work, but no big loss if it doesn’t. There’s always more for all of us to discover! At what point do you decide to use a scraper instead of a plane? Do you intend to use it on some woods as a final surface preparation, or are you driven to it by tear-out? gotcha. yes you have a point there that I didn’t think of. That interlocked grain was actually impossible for me to handplane without massive tearout, and it left too fuzzy of a surface with the regularly sharpened card scraper so I had to resort to sanding (blech!) 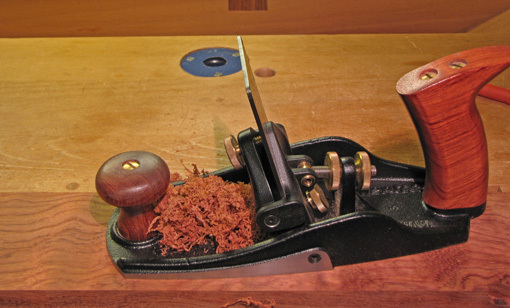 That may have been a great place to use a true scraper plane like this nice Veritas one. thanks for your advice. I usually give it a try with a plane as the first choice, then go to scraping if tear out is a problem. But on some nasty woods I just go straight to scraping. 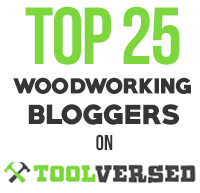 The main thing for me is having the tool and technique options to deal with just about any wood since a good majority of the wood I use is figured. No sin in sanding. Sometimes that’s the best choice. It’s the results that matter. Enjoy. Do you see much difference in the final finish (chatoyance) of figured woods when you use scraping instead of planing? Figured bubinga is dense and wild: 55 or 60° planing vs thin-shaving scraping, not much difference. I’m scraping this bad boy. And it responds well to very fine finish sanding. Curly domestics: I’d rather plane them if I can. Very roey mahogany: get real and scrape. Fine finish sand. Also, it depends on the type of finish that will be applied. Oil vs film finish (shellac, varnish, etc.). Again, the key is that every wood and every project are different. Have a range of tools and skills to bring to bear as needed, and, most of all, experiment! thanks for making sense of that for me. At the other end of the spectrum, when would you use a very low angle plane for finishing – or would you? Great post, comments, and replies! The attack angle (aka cutting angle) is the bed angle for a bevel down plane, while for a bevel up plane it is the bed angle plus the honing angle of the blade. In general, a lower cutting angle, 45-50°, is used for tamer woods such as unfigured walnut or cherry. A higher cutting angle, 55-60° is typically used for difficult figured woods. Scraping is an alternative for difficult woods, especially when it is just too difficult to plane without tearout. Sanding, done skillfully and in the right situations, is another option, and, contrary to the view of some, is not a sin. Experiment!! !